The tables below present a modest number of reports whose results, considered collectively, do not provide consistent support for an association between elevated peripheral blood levels of inflammatory markers (C-reactive protein [CRP], interleukin-6 [IL-6], alpha-1-antichymotrypsin [ACT], fibrinogen, lipoprotein-associated phospholipase A2 [Lp-PLA2], interleukin-1β [IL-1β] ) and risk for Alzheimer disease (AD). Associations between higher levels of these markers and total dementia risk are more suggestive, consistent with a reported link between vascular inflammation and vascular dementia. Individual markers were significantly associated with AD in some studies, but the evidence overall was inconsistent. The ability of peripheral inflammatory markers to represent inflammation in the central nervous system (CNS) is limited, and future studies may provide more clarity on the distinction between the roles of peripheral and CNS inflammation by identifying and measuring brain-specific markers of inflammation. In addition, it is possible that measurement of an overall inflammatory profile, particularly as it unfolds over time, may provide a much better test of the inflammatory hypothesis than individual markers measured on a single occasion. In the meantime, inflammatory responses might have an impact on disease progression, and could be the basis for developing and monitoring therapeutic treatments. For a review of the putative mechanisms by which inflammatory biomarkers may be related to AD risk and detailed commentary on interpreting the findings below in a broader context, please view the Discussion. A longer review and discussion of CRP and IL-6 can be found in the related earlier published review and meta-analysis, Koyama A, O’Brien J, Weuve J, Blacker D, Metti A, Yaffe K. The role of peripheral inflammatory markers in dementia and Alzheimer’s disease: A meta-analysis (J Gerontol A Biol Sci Med Sci 2013 April;68(4):433-440). We searched MEDLINE for peer-reviewed articles reporting on the association between inflammatory biomarkers and Alzheimer’s disease (AD) incidence in cohort or nested case-control studies. 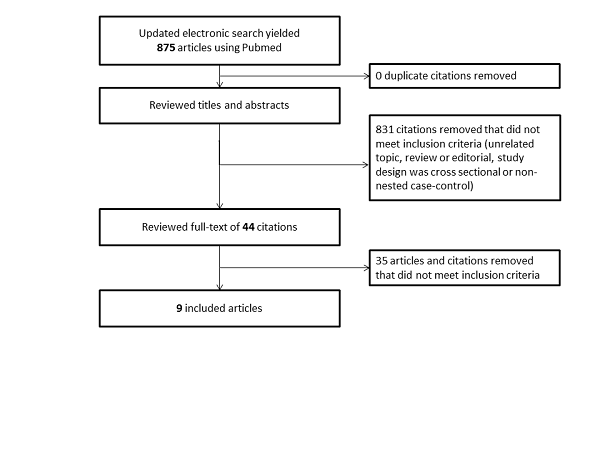 The original search returned 820 unique citations that, after title and abstract review against our inclusion criteria, were narrowed down to 43 citations for full-text review. 9 fully met criteria for inclusion in our summary tables. Please see our methods section for more detail on our general systematic review methods. We ran an update of the search in Pubmed on May 12, 2014. The new search (which covered articles published between April 28, 2013 and May 12, 2014) returned 55 new citations. We excluded 54 citations after a title and abstract review that did not meet our inclusion criteria (e.g., animal studies, reviews, cross-sectional design), and 1 citation after full text review, because it did not meet inclusion criteria. No articles were added to our Alzrisk tables from this updated search. Certain markers (e.g., fibrinogen, lipoprotein-associated phospholipase A2 [Lp-PLA2], interleukin-1β [IL-1β], were not included as terms in our search strategy, but they did appear in papers that reported on other biomarkers (e.g., CRP, IL-6). These and similar terms will be integrated into the search strategy for future updates. 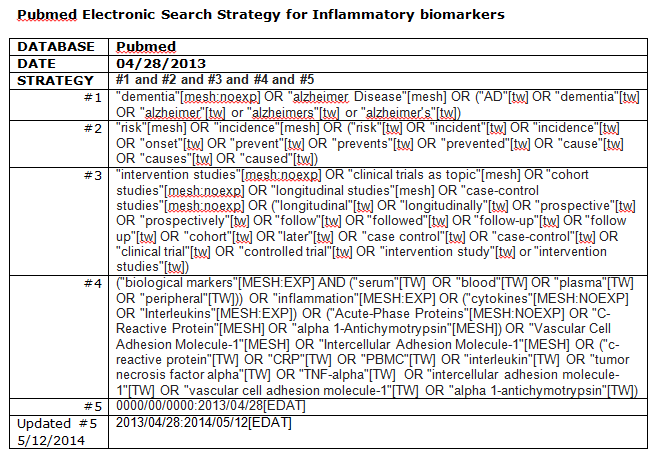 Using our systematic review methods, we developed a search strategy (table below) for Pubmed. Some cohort studies produced multiple articles reporting on the association between inflammatory biomarkers and risk for Alzheimer’s disease. To avoid presenting duplicate results, we reviewed such articles on a case-by-case basis and selected the most informative article(s) based on sample size, follow-up time, exposure assessment or modeling, and appropriateness of analytic methods. For each cohort listed below, we cite the duplicative articles we reviewed and give our rationale for their inclusion or exclusion. The full citation for each article is provided in the reference section. We have included both van Oijen 2005 and Engelhart 2004 because they report on different inflammatory biomarkers. Engelhart 2004 presents results for plasma CRP (continuous), plasma IL-6 (continuous), and plasma ACT (continuous). Van Oijen 2005 reports results for serum hsCRP (continuous), as well as plasma fibrinogen (continuous and categorical). We have included both Tan 2007 and van Himbergen 2012 because they report on different biomarkers. Tan 2007 provides results for serum CRP (categorical) and serum IL-6 (categorical). Van Himbergen 2012 has updated results for CRP, this time using plasma hsCRP (continuous), and includes results for Lp-PLA2. Engelhart M, Geerlings MI, Meijer J, et al. Inflammatory proteins in plasma and the risk of dementia. Arch Neurol 2004;61:668-672. Tan ZS, Beiser AS, Vasan R, et al. Inflammatory markers and the risk of Alzheimer disease: The Framingham Study. Neurology 2007;68:1902-1908. Van Himbergen TM, Beiser AS, Masumi A, et al. Biomarkers for insulin resistance and inflammation and the risk for all-cause dementia and Alzheimer disease. Arch Neurol 2012;69:594-600. Van Oijen M, Witteman JC, Hofman A, et al. Fibrinogen is associated with an increased risk of Alzheimer disease and vascular dementia. Stroke 2005;36:2637-2641.